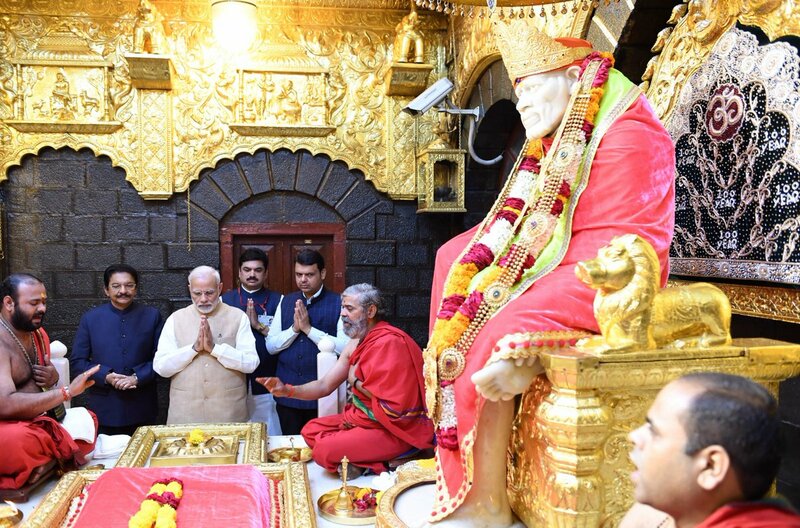 Mumbai: The Prime Minister, Shri Narendra Modi, visited Shirdi, in Maharashtra, today. At a public meeting, he unveiled the plaque to mark the laying of foundation stone of various development works of Shri Saibaba Sansthan Trust. He also released a silver coin to commemorate the Centenary year of Shri Saibaba Samadhi. Shri Narendra Modi handed over keys to mark the Grihapravesh of Prime Minister Awas Yojana- Grameen (PMAY-G) beneficiaries in Maharashtra. He also interacted with beneficiaries from various districts in Maharashtra like Satara, Latur, Nandurbar, Amaravati, Thane, Solapur, Nagpur through video conference. The beneficiaries, mostly women, thanked the Prime Minister for their new good quality houses, easy availability of credit and corruption free processes associated with PMAY-G scheme. Prime Minister later addressed the gathering. Speaking on the occasion, Prime Minister extended Dussehra greetings to all Indians. He said that being amongst people during the auspicious occasion of Dussehra gives him energy and renewed vigour to work for the betterment of the country. Recalling the contributions of Shri Saibaba to the society, Prime Minister said that his teachings give us the mantra to build a strong unified society and to serve humanity with love. He added that Shirdi is always considered as an epitome of public service. He expressed happiness that Shri Saibaba Sansthan Trust is following the path laid down by Saibaba. He also complimented the contributions of the trust in empowering the society through education and in transforming thoughts through spiritual teachings. Expressing happiness in handing over new houses to over 2 lakh beneficiaries under Pradhan Mantri Awas Yojana- Grameen (PMAY-G) on occasion of Dussehra, Prime Minister said that it is a big step towards the fight against poverty. Underlining the efforts of Government in ensuring ‘Housing for All’ by 2022, Prime Minister said that in the last four years, Government has built over 1.25 crore houses. He said that the Government is also ensuring that the every house built is not only of good quality but also has a toilet, gas connection and electricity. Addressing the gathering, Prime Minister congratulated the people of Maharashtra for making the state Open Defecation Free. He also commended the efforts of the Maharashtra Government towards Swacchh Bharat activities. In this context, Prime Minister spoke about Pradhan Mantri Jan Arogya Yojana (PMJAY) and said that around one lakh people have benefited from the scheme so far. He added that under PMJAY, modern medical infrastructure is getting readied. Prime Minister also underlined the efforts taken by the Government to deal with drought faced by Maharashtra. In this context, he mentioned Krishi Sinchai Yojana and Fazal Bima Yojana and appreciated the Jalyukt Shivir Abhiyan of Maharashtra Government. He also commended the people’s participation in the de-siltation of irrigation canals undertaken by the Maharashtra Government. Remembering the teachings of B R Ambedkar, Jyotirao Phule and Chattrapati Shivaji, Prime Minister asked the countrymen to follow their noble ideals and teachings and work towards creating a strong undivided society. He urged the people to work towards attaining Sabka Saath, Sabka Vikas and Ek Bharat Shresht Bharat. 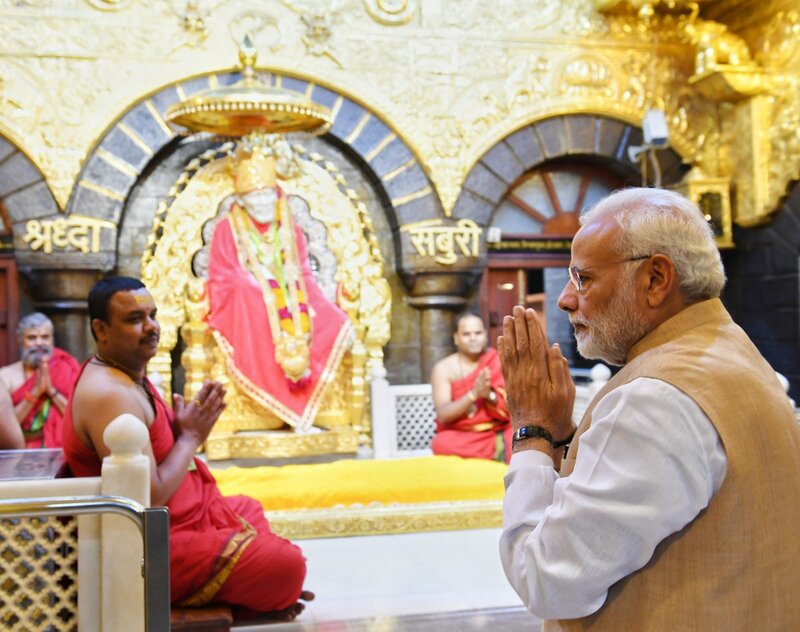 Earlier in the day, Prime Minister visited the Shri Saibaba Samadhi Temple Complex and offered prayers. He also attended the valedictory function of centenary celebration of Shri Saibaba.